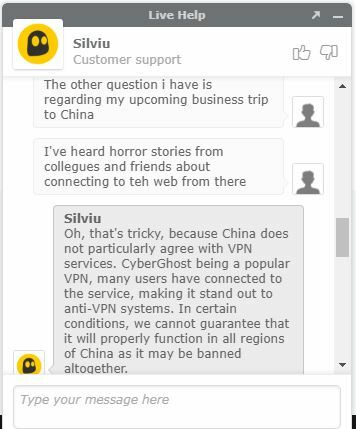 Don't get a subscription to CyberGhost if you're going to China! The VPN has had issues getting past the Great Firewall of China in recent months. If you are looking for a VPN that will work in China you should check our review of ExpressVPN. However, if you want to increase your online privacy and stay away from the government’s spying eyes, CyberGhost VPN may be just what you need. Based in Romania, the VPN is out of the 14 Eyes countries that share signals intelligence. In fact, CyberGhost VPN doesn’t keep any logs of your activity. As long as you connect to a CyberGhost server, no one can track your past searches online. What Else Makes This VPN One of the Best? CyberGhost is the first company to create self-managed and owned no-spy servers in Romania. Thanks to a crowd sourcing campaign, the company is well on its way to having full control over its own servers. No more relying on third-party servers! This, coupled with the fact that they’ve bulked up their security features to include 256-bit encryption means that users can securely watch US Netflix, BBC iPlayer, and Hulu from all their favorite devices. The VPN is available on all platforms and devices including Windows, Mac OS, iPhones, iPads, Android, Linux and most routers. Better yet, users can connect 7 devices at the same time. If you act now you can get 6 month free when you sign up for an annual subscription. Downloading CyberGhost VPN is quick and painless. The process takes a matter of minutes and you can use the VPN straight away. To come up with the most accurate results, we tested servers in three popular areas of the world. These areas include the US, the UK, and Australia. We also tested these over the space of seven days to see which days the VPN performs at its best. While not the fastest VPN in the industry, we connected to servers in the UK and downloads were fast. Additionally, despite a slow start, we were able to watch shows on BBC iPlayer without any buffering. If you are still not running as quickly as you would like to, try connecting to a different server. High peaks can lead to capacity problems. Also, try and connect to a server that is closer to your physical location. Additionally, you can go to Settings and open the Connection tab. From there, the VPN gives you a few options to try out to increase its speed. When it comes to security, CyberGhost uses an industry-leading OpenVPN setup to secure user connections. At the same time, the company doesn’t use public pre-shared keys for its L2TP connections. 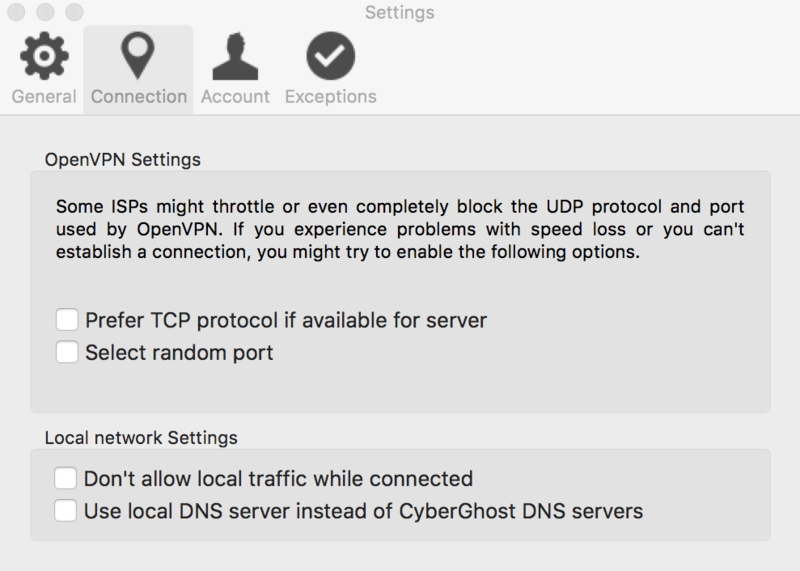 To learn more about setting up OpenVPN and L2TP/IPsec connections, CyberGhost has individual guides specific to various devices. CyberGhost’s claims that it has IP and DNS leak protection built-in is correct. We put the software to the test by using ipleak.net which tests for both IPv4 and IPv6 DNS leaks. The company passed with flying colors. CyberGhost VPN has an impressive network of over 2,600 servers scattered across the world. While most of the company’s servers are in Europe, the UK, and North America, they have at least one on nearly every continent. Better yet, CyberGhost now has its primary set of self-managed, no-spy servers located in Romania. With these, CyberGhost no longer has to rely on third-party server providers as much, making data much more secure. And, if that’s not enough, the U.S. has no legal jurisdiction over Romania so gaining access to information is unlikely. P2P, or torrenting, is only available on select servers. Through these servers, users can share files directly between systems on a network without the need for a central server. These are perfect for anonymous downloads thanks to their no-logs policy. Better yet, the servers don’t limit bandwidth. One of the best features of CyberGhost VPN is that you can choose the server you want from their list. 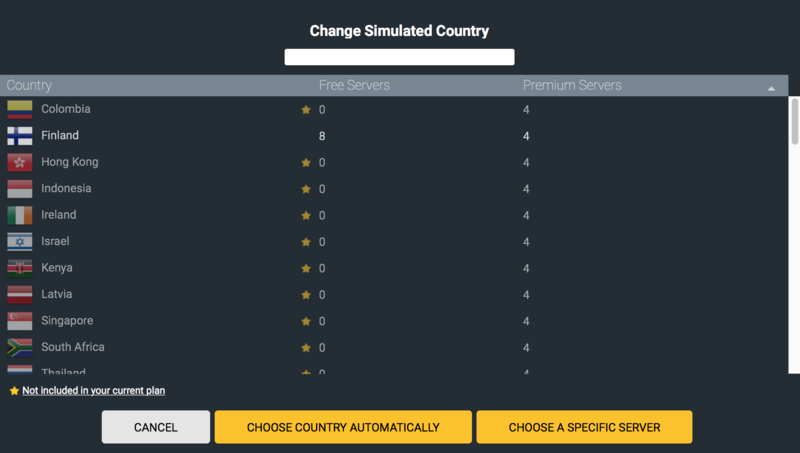 While the VPN will connect you to a server at random, you can change the settings to pick a specific server in a specific country. CyberGhost VPN can unblock a number of streaming channels, including Netflix, BBC iPlayer, and Hulu. When it comes to user experience, CyberGhost is one of the easiest to download and use. Getting started takes just a few clicks of the mouse. All you have to do is choose your server and you’re ready for business. If you don’t mind which server you connect to, it will connect you at random. That said, you can quickly and easily change the country and server with the click of just a few buttons. Once you have chosen your simulated country on the left side, you can then choose your simulated location on the right side. By clicking on “simulated location”, you’ll gain a view of all locations within your chosen country allowing you to make your final choice. CyberGhost is a promoter of civil rights and aims to make its services available to people across the world. That said, there are regions of China where the company cannot guarantee that the VPN will function. When asking for advice from customer service, they recommend that we manually configure the VPN to connect via the L2TP protocol. But, the support team also said that if the manual configuration to L2TP/IPSEC fails to achieve a connection to one of the servers, it means that the area has high restrictions regarding the use of VPN servers. With this in mind, we couldn’t confirm whether or not CyberGhost VPN can bypass the Great Firewall of China. 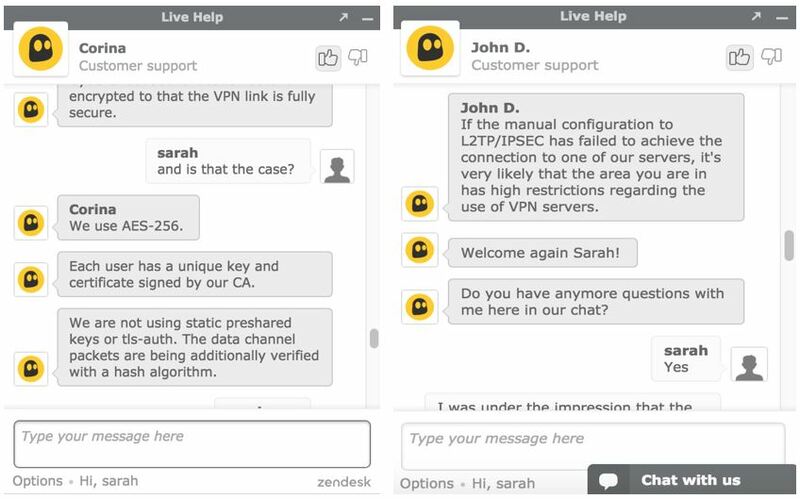 To see how quickly and efficiently CyberGhost VPN responds to its customers, we put them to the test using different support channels. The best way to get in touch with a member of their team is via live chat. A member of the customer support team responded promptly, politely, and quickly. CyberGhost VPN offers a 45-day money back guarantee feature. According to the website, this offer is applicable to all their plans. All in all, the customer support team is very friendly and knowledgeable. Additionally, the website has a “Help & FAQ” section that offers a huge variety of interesting and helpful resources. Plus, the company’s guides are specific to individual devices and operating systems. For such an effective tool, it is a surprise that CyberGhost VPN can offer such incredible pricing plans for its services. In fact, if you opt for the 18 month subscription, you'll receive 6 months free (12 months + 6 free). You can choose from 3 other packages and the longer the package the better the value. If you decide to go ahead and buy plan, CyberGhost will give you a full refund within 45 days if you’re not happy with the service. You can pay for your VPN via Visa, MasterCard, and American Express credit or debit card. You can also use Paypal. Additionally, the company accepts Bitcoin payments which allows for more anonymity if set up correctly. That said, it’s worth noting that CyberGhost can still track your IP address even if you pay with Bitcoins.